Please note all correspondence to Balrothery Community Council or Chairman must be sent or copied to secretary@balrothery.com This ensures your correspondence is recorded and raised at next BCC meeting, thank you. Senior Social Night Thurs 21st February in The Armory, Balrothery Inn. Village Christmas tree lighting Saturday 8th of December at 5pm Meet and greet Santa in Heritage Centre afterwards. 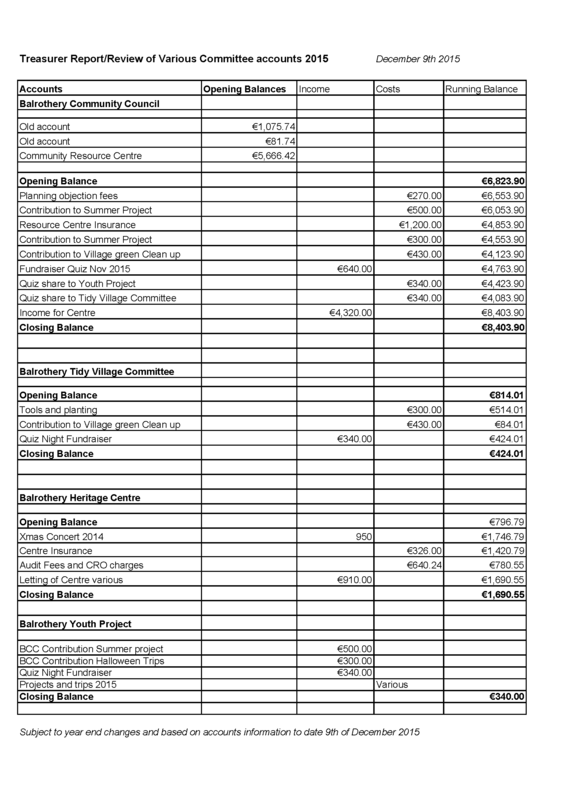 Following on from AGM december 9th 2015, please find following Treasurer’s report of various Committee’s accounts 2015. Please note, as first year reporting these accounts, some accounts may be subject to changes before year end adjustments. Many thanks to all contributions, donations for various projects and fundraisers from community and businesses, also for all hours put in by members and community for 2015. Well done to all involved, look forward to a great 2016 for Balrothery Community!